Senior all-state quarterback safety Brady Dinkel went to the emergency room shortly after Victoria’s season-opening home victory versus Central Plains. Dinkel was eventually life-watched to Wichita with internal issues. At that time, Knight coach Doug Oberle simply wanted to see Dinkel wearing his Victoria uniform in church on game day mornings. Two months later, Dinkel will return to the field for the first time. He was medically cleared to practice about two weeks ago but hasn’t played yet. Victoria had a an open date last Friday. On Thursday, Victoria travels to Otis-Bison in a high-profile Central Prairie League matchup that will decide Eight-Man, Division II, District 7. Victoria is No. 1 at 7-0, while Otis-Bison stands at 8-0 and ranked fourth. “I think it’s great for him, and I know some people are going to question that, but it’s hard to say no to a kid who works that hard,” Oberle said. “The amount of time, the amount of effort that he has put in to becoming a good football player. Senior Joe Dortland, known for his unflappable presence since he took over for Dinkel, will remain at quarterback after he has accounted for 19 scores and made few mistakes. Dinkel is expected to play both sides of the ball in limited action. Oberle called Dinkel’s return both surprising and gratifying considering where the senior was during Labor Day weekend. Oberle said it’s been great to see Dinkel practicing again, commiserating with teammates and displaying his elite talent. “Hopefully, we have some good success on down the road with him, and hopefully his journey will end up the way he will want it to end up,” Oberle said. The winner of Thursday’s contest gains a first-round home playoff game next Tuesday versus Triplains-Brewster (6-2), while the loser has to travel to No. 2 Wallace County (8-0). Oberle wants Victoria, which hasn’t lost a home game since Week 2 of the 2012 season and has won 19 straight contests, to have a home game next Tuesday. The Knights have won seven of the last 10 meetings, though Otis-Bison had captured three straight before Victoria won the last two. Victoria and Otis-Bison are both very experienced, run-heavy teams with veterans at nearly every position. The Cougars have quarterback Kade Urban and Brad Lightfoot, both juniors who have started since freshman year. Urban has accounted for 16 scores, while Lightfoot has 1,098 rushing yards and 21 rushing TDs. Otis-Bison has averaged 276 rushing yards a game, an output slightly better than its state runner-up squad in 2010. Coach Travis Starr would like to have a little more balance from a passing offense that’s averaged 44 yards a contest. Otis-Bison has had several players banged up, including senior end Hayden Maier, sophomore lineman Landon Hoopingarner and junior lineman Bryce Maneth, but everyone is expected to play Thursday. The Cougars have plenty of depth, especially up front, and have often platooned linemen, rare for an eight-man school. While the Knights are known for its senior line of Eric McAlonan, Wheaton Hockersmith and Brandon Brungardt, Victoria has had several players step up. Senior Parker Riedel, at 5-foot-2 and under 130 pounds, is a state powerlifting record holder. He has enjoyed great improvement and leads the Knights in rushing with 488 yards and has blocked well. Sophomore Cooper Pfanenstiel (385 offensive yards, 30 tackles) has ran well and has emerged at linebacker. Pfanenstiel plays defensive line part of his freshman year before he moved to linebacker in the second half. Pfanenstiel turned his ankle early in Victoria’s last contest and missed most of the game but is expected to play Thursday. Riedel, Dortland and Pfanenstiel have helped replace Dinkel and senior Lane Kisner, banged up with a hamstring and a broken hand, in the backfield. 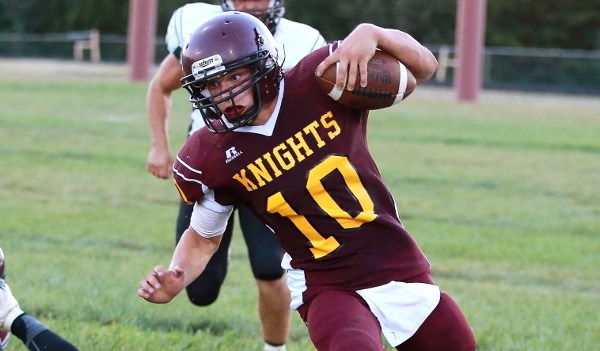 “He has come a long ways this year,” Oberle said of Pfanenstiel, the youngest starter for the Knights. Senior Grant Weber has improved at cornerback and has three interceptions, including two last week versus Thunder Ridge. Weber turned one INT into a pick-six.